Deliver an optimal user experience to all devices&#8212;including tablets, smartphones, feature phones, laptops, and large screens&#8212;by learning the basics of responsive web design. In this hands-on guide, UX designer Clarissa Peterson explains how responsive web design works, and takes you through a responsive workflow from project kickoff to site launch. 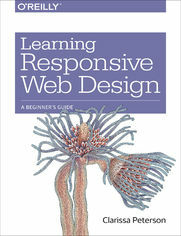 Ideal for anyone involved in the process of creating websites&#8212;not just developers&#8212;this book teaches you fundamental strategies and techniques for using HTML and CSS to design websites that not only adapt to any screen size, but also use progressive enhancement to provide a better user experience based on device capabilities such as touchscreens and retina displays.